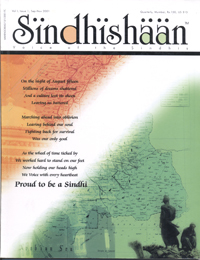 Our story begins nearly 70 years ago in Sindh, then a region of northwestern India. It was a period when the condition of religious practices among Hindus had degenerated from its earlier levels primarily due to the sustained impact of western attitudes upon their civilization resulting in a change in the quality of life. The whole fabric of Sindhi culture was unraveling. Their food and drink, for instance, once of the purest (satvic) type – fresh vegetarian meals prepared in a spirit of devotion and eaten in ritual remembrance of the deities, in large yet close-knit family gatherings – had gradually become impure (tamopradhan). People continued to perform their traditional worship at least outwardly, but the ceremonies became inevitably empties of their once exalted meaning. Man’s mind was filled now with the greed for money, the hunger for status. Trickery became the order of the day, anger exploded within the contours of every relationship and the very content of people’s speech shifted from subjects of piety and spirituality to that of their new cravings and worldly desires, their hatreds and their lust. New customs developed eating away at the fabric of the Indian society, which is considered as the oldest, firmest and deepest amongst the world. The very seat of human achievement was being shaken, an ominous sign, although not recognized, that the entire world was entering its final paroxysms of unrest before the process of renewal could begin. Outwardly they prospered. The men of the Sindhi community worked hard and grew rich, but peace and order was missing from their lives. Who was there to guide the people back to the path of wholesomeness? In this bewildering atmosphere, there was on individual of the Sindhi community, in the city of Hyderabad, who was distinctly different from all the rest. He was called by the sweet name ‘Dada’ while his full name was Dada Lekh Raj. The beginning of the journey of spiritual enlightenment starts with the story of Dada Lekh Raj as a devotee, before becoming Brahma Baba, the medium of Shiva Baba. It is the story of a man into whose life there came greater wonder of all time, an occurrence of such extraordinary magnitude that it brought about sudden and total transformation – not only in the life of one individual, but of everyone who came in contact and soon the whole world. Dada Lekh Raj was born in 1876 in Sindh in the Kripalani household. Dada’s father was a schoolmaster by profession, but his son decided early to not follow his father’s footsteps. He began his own career as a small merchant of wheat and he saved all that he could from his meager earnings. When he had set aside sufficient funds to embark on a more ambitious enterprise, he entered the diamond trade. In a very short time, he reputation grew and his business became more and more profitable. He was afforded utmost respect – not merely because of his brilliant diamonds but because of the brilliance they felt within him. Everyone knew of Dada’s religious faith, his pure nature and conduct. Though by birth he was an ordinary man, still there were many special qualities in him, qualities apparent though indefinable even on first glance. Dada’s winning nature endeared him to the whole community of Sindhis. He had often proved to be a rock, a symbol of solidarity and dependability in the shifting sands of unstable world. Though born in a middle class family, Dada rose quickly in his profession by dint of hard effort, honesty and focused intellect, to achieve a position among the wealthy and become one of the richest men in India. Graceful and seemingly always in motion – that was Dada Lekh Raj. Dada’s religious devotion and his righteous tendencies of mind were so mature and so powerful that whatever the occasion, the fire of virtue could be felt to burn within his every act. During the late fifties of his life he began to receive indescribable experiences within himself. It was during that phase that he saw many divine visions. He had a vision of the Incorporeal Supreme Soul – The Being of Light (Supreme Father God Shiva). He recognized these unique inner sensations as the onset of a spiritual encounter, but did not understand their cause or purpose. A series of such experiences turned Dada’s mind towards the Supreme Father, the Supreme Soul or the Incorporeal One. He realised at last that there is only one Satguru, and that is God himself. He soon realised he was being ingeniously prepared, through a series of successively deeper revelations, to receive the total, shattering impact of truth and life. Dada gave himself up to the gentle Master who he knew was guiding him to this final realization. Finally the day came, Dada received a double revelation, first a vision of Jyotirlingam SHIVA Parmatma (The Supreme Soul, whose eternal form is a Point of Light) and then a terrifying vision of the destruction of the modern world. Dada fell into deep thought. He immersed himself in the work of solving the mystery of this unparallel event. “Who was that? What kind of power could give me such visions, such knowledge, such self-realisation?” Gradually he unraveled the logic and the implications of it all, the secret was unveiled to his astounded intellect. Yes, it was really so : God, the Supreme Soul, Shiva, Himself has entered into his body. When Shiva entered Dada’s body, he renamed that soul whose chariot He now shared, with the name of Prajapita Brahma. All those who heard the knowledge, which Shiva spoke through Brahma, became the mouthborn progeny or Brahmins. And thus, no matter what age they were, all who recognize Him became His ‘sweet children.’ They took the name ‘Brahma Kumars and Brahma Kumaris,’ the pure sons and daughters of Brahma. They gathered to him like needles to a magnet, and then stayed. And so an institution was created out of the love of souls for God, an institution of purification, a sacrificial fire, a Yagya. And the Yagya grew and grew, as more and more souls heard and understood. Their hearts simply melted to grasp the nature of the process that was going on, the world was actually being transformed before their eyes. It began with one soul, that of Prajapita Brahma. Today there are numerous followers whose minds are firmly tuned to Baba, who are purifying their natures, their sanskaras (innate tendencies or personality), and who are channeling Baba’s incredible vibrations into the material world, secretly affecting nature itself, causing the present Iron Age to come to an end and paving the way for an Age of Gold, heralding the reappearance of the Royal Dynasty of the Sun. Dada used to offer his religious discourses through his Satsangs. In a short time the word spread and crowds gathered to attend the Satsangs. There was tremendous power in his words, and as his listeners churned over the extraordinary ideas in their minds, they became happier. They immediately felt the charged vibrations in the atmosphere, vibrations of warmth and love and power, which could not issue from a human being, and they gradually comprehended that Dada had become the corporeal medium, which was being used by God to disseminate His Highest Knowledge. The people of Sindh were amazed at the results and a general feeling of respect for Baba grew in the community. From the beginning until now, Baba has placed the Urn of Knowledge on the heads of Kumaris and mothers, making them primarily responsible for the dissemination of the Godly wisdom. The Satsang continued to grow, and with the increase in numbers, a formal structure was needed. 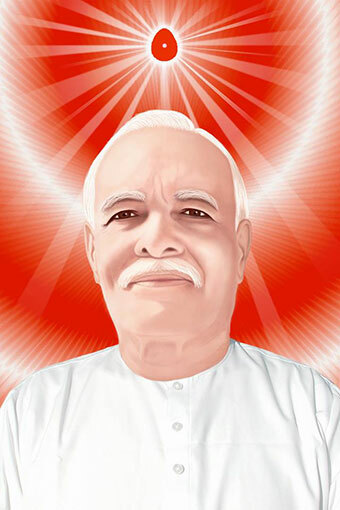 Thus the Prajapita Brahma Kumaris Ishwariya Vishwa Vidyalaya was formed. Brahma Baba left the body in 1969 after dedicating 33 years to realizing his vision of people of all cultural, economic and religious backgrounds coming together to rediscover and develop the spiritual dimensions of their lives. God had revealed the truth about the coming destruction, and of the establishment of the heavenly world, which would then follow. And it was God Himself who had given the sign that, Dada was to be His medium for creating such a divine world.